An Australian newspaper may have spilled the beans on a couple of new villains found in Batman: Arkham City. 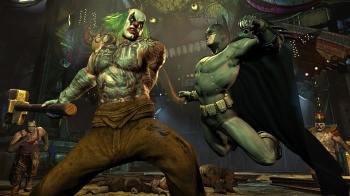 In Rocksteady Studios' upcoming Batman: Arkham City, the caped crusader already seemed to have his hands full with confirmed villains such as Hugo Strange, Two-Face, Joker, Harley Quinn, the Riddler, Catwoman, and an entire squad of mercenaries, but according to new information there're a bunch more still hiding behind the curtain. Arkhamcity.co.uk reports that an article in the Australian Sunday Herald reveals a significant one, modeled after a land-locked bird. Can you guess who it is? No, not the Ostrich. 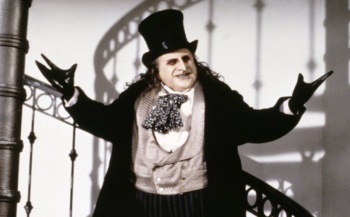 Rocksteady's Dax Ginn reportedly confirms the appearance of the Penguin. Penguin was believed to appear somewhere in the game after the Iceberg Lounge, an establishment he owns, appeared in an Arkham City trailer. If the article is genuine, Ginn says: "We've made him a really horrible, nasty piece of work - but still with the delusion of grandeur. He dresses well, but in a poor taste, and we've made him this brutish, brutal guy but also key into collection fascination that he's had through out the years." Penguin evidently runs a museum now, filled with all sorts of objects including heavy artillery. Unfortunately for Batman, his goons will reflect this. A reported scan of the Herald shows a snarling Penguin alongside a one-armed thug holding a giant blade. This is similar to the one-armed Joker-themed thugs previously seen in official screenshots. The Herald further mentions Black Mask, also not officially confirmed for Arkham City yet, though the crime lord was believed to have been seen getting beaten by goons in this trailer (27 seconds in). The full list additionally mentions Zsasz, Calendar Man, and Mr. Freeze. Don't take this as official confirmation quite yet, but it seems likely. If Ginn actually took to an Australian newspaper to reveal this scoop, I would expect Rocksteady or Warner Bros. to release new information on the Penguin soon.